Easter arrives in a few days, so menu planning is ramping up. Having a big roast? Or maybe baked ham or a leg of lamb? If you’re serving any of the above, you’ll probably want a rich, starchy side dish to go with it. Scalloped potatoes are a popular choice, of course—and this dish takes them as a starting point. But then we add celery root (celeriac) to dial the flavor up a notch. We also add some sharp Gruyère and Parmigiano-Reggiano cheese, and just a touch of zippy Dijon mustard. The result is irresistibly good. But fair warning: If you’re feeding a holiday crowd, you may want to double this recipe. Otherwise, the serving dish might not make it all the way around the table. You can omit the potato entirely and just use celery root (celeriac) in this dish. But celery root tends to be pricey in the US (where it’s not widely used). Besides, the flavors of celery root and potato marry beautifully. So I often combine them just because they bring out the best in each other. For a gratin like this one, my basic rule of thumb is to use a cup of liquid (cream, half-and-half, or milk) and 4 or 5 ounces of grated cheese for every pound of potatoes/celery root. You can vary these amounts a bit—this is a pretty forgiving recipe—but this formula always works well for me. It’s the same ratio we used when making the Gratin Dauphinois that we discussed a couple of years ago. This recipe makes enough to fill a gratin dish that measures about 8 x 11 inches (13 inches with handles) and that holds about 7 cups of liquid. This will be enough for 6 to 8 servings. But your guests will want seconds, so you if you’re feeding a crowd, you really might want to double the recipe. In that case, use a casserole that measures about 9 x 13 inches (a Pyrex dish is ideal). Prep time for this recipe is about 15 minutes (it could be 5 minutes more or less depending on how quickly you work). Then add another hour or so (mostly unattended) for baking time. Leftovers keep well for a few days if refrigerated in an air-tight container. Preheat oven to 375 degrees Fahrenheit. Arrange one rack in the middle of the oven, and another in the bottom position. On the lower rack, place a baking sheet, preferably one that’s rimmed. The purpose of this is to catch any drips if the liquid in the gratin bubbles over while baking (this doesn’t usually happen, but it can). You may wish to line the baking sheet with aluminum foil for easier cleanup. Peel the shallots and mince them finely. Place a 2-quart saucepan on medium stovetop heat. Add 1 tablespoon butter, and when it’s melted and sizzling, add the minced shallots. Sauté for 4 minutes. Add the half-and-half (or cream, or whatever you’re using), mustard, 1 teaspoon kosher salt, and ¼ teaspoon freshly ground black pepper to the saucepan. Heat until the half-and-half is warm (you don’t want to bring this to a simmer, just warm it well). Meanwhile, grate the cheeses and set them aside. I suggest using the grating attachment on the food processor to speed things along, but a 4-sided box grater works fine too. Scrub and peel the celery root and potatoes (see Notes for instructions on how to peel celeriac; it discolors once it’s peeled, but that doesn’t matter much for this dish). Cut the celery root and potatoes into thin slices (about 3/16 inch is ideal; see Notes). You can use a mandoline, a vegetable slicer, or a knife for slicing. If you’re using a mandoline, remember that the blade is wicked sharp—use the safety guard that comes with it so you don’t risk losing a finger. Butter the baking dish well. By now, the half-and-half should be warm, so you can begin to assemble the dish. Arrange some celery root slices in the baking dish so they overlap and form a layer. When the first layer is complete, sprinkle with Gruyère and add a small ladle of the warm half-and-half. Repeat with a layer of potatoes. Continue until you’ve used all the celery root and potatoes, saving perhaps a quarter of the Gruyère for the top layer. Once you’ve layered all the celery root and potatoes, pour on the remaining half-and-half. Top the gratin with Gruyère and sprinkle on the Parmesan, covering the top evenly. Bake the gratin on the middle oven rack until done, usually about an hour. “Done” means the top is a nice, bubbly brown—and if you insert a paring knife into the potatoes, it goes in without resistance. If the potatoes are cooked through, but the top of the gratin isn’t as brown as you’d like, run it under the broiler for a minute or two. Garnish the gratin with parsley or chives (if desired), and serve. I like the flavor of shallots, so I sometimes double the amount specified here. You can reduce or omit the shallots if you want—the dish will still be pretty good, though it will lack a little ting. Cream is the traditional liquid of choice for a gratin like this. I think half-and-half tastes just as good, without quite as much fat. You can also use milk (even skim milk), although the flavor won’t be as luscious. Whatever your choice of dairy, it will reduce as it cooks—making a nice, thick sauce. The starch in potatoes thickens half-and-half, which is why you wouldn’t want to use béchamel sauce (which is already thick) when making this dish. One tablespoon of mustard provides subtle flavor in this dish. If you want a more in-your-face mustard presence, you can increase the amount to 2 tablespoons. You can also add a bit of hot sauce (such as Tabasco) if you want added zip. I like to use equal parts of celery root and potato for this dish. But if you have a bit more of one than the other, it won’t matter. Celery root has a tough hide, but a good swivel peeler works quite well or it. Or do as I do: Perch the celeriac on one end, then use a knife to slice off the peel (much as you might cut the peel off an orange). You lose a bit of the celeriac flesh this way, but you’ll be able to peel it in well under a minute. Waxy potatoes are traditional in most potato gratins because they hold their shape when cooked. I like to use waxy varieties when I’m slicing potatoes rather thickly (¼ inch or a bit more, as I sometimes do for classic scalloped potatoes). But when I’m slicing them thinly—3/16 inch or less, as in this dish—I prefer to use russet (baking) potatoes. I find that the slices merge with the cheese and half-and-half, and “melt” together. If you’d like to turn this recipe into a hearty one-dish meal, just mix in some pieces of cooked ham or bacon. “Mustard and celery root make such a natural combo,” I said. “Remember, we used mustard in the dressing for the Celery Root Rémoulade we posted about in February." “It also looks like a cross between a rock and a giant turnip,” said Mrs K R.
“Hey, I’ve got it: The Undercover Veggie—Taking Celery Back to its Roots," said Mrs K R.
You’ll be glad to hear that Mrs K R has no plans to start a PR firm anytime soon. Those sound like delicious additions to traditional gratin potatoes. Gorgeous Dish! Would love some! Delicious!!! Scalloped potatoes by themselves are fab enough, adding celeriac seems to be a genius touch. I have never had celery root, not conciously, so I will be keeping a lookout for it. Oh wow, perfect side dish for the Easter ham! I'll be sure and have your blog address handy for my guests as well. Thanks for this recipe. Hi Nee, your older son is my kind of guy! 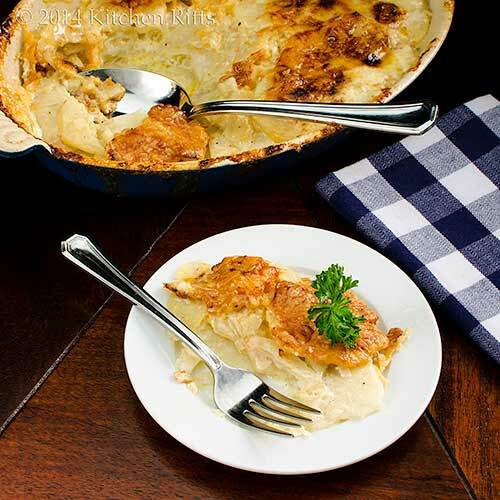 This is such a good recipe -- it's scalloped potatoes on steroids. You'll like it! Thanks for the comment. Hi Mae, isn't this nice? Such a great twist on a traditional recipe. Thanks for the comment. Hi Jerry, celery root is such good stuff! And wonderful in this dish. Thanks for the comment. Hi Shibi, celery root really has super flavor -- definitely worth trying. Thanks for the comment. Hi Asmita, don't you like a dish with a nice brown cheesy top? I sure do! Thanks for the comment. Hi Minnie, celery root and potatoes is a wonderful combo. Mash the two together to make fabulous mashed potatoes! Thanks for the comment. Hi Karen, this is so worth making. I'm making it again this weekend! Thanks for the comment. Delicious looking dish like that will surely not make it all the way around the table in my house. It may not even make it half-way. :) Love those crust, John. Perfect for Easter feast. Happy Easter to you and the family. This is a nice dish specially those toasted parts! P.S. Tell Mrs. K.R. the Celery Promotion Board could sure use her advice and your recipes!!! This looks so creamy and delicious, I like gratin so much. Thanks for the recipe john. Hi Ray, it's actually pretty hard for this dish to make it past me. ;-) Thanks for the comment, and Happy Easter! Hi Raymund, that crusty cheese topping is so nice, isn't it? ;-) Thanks for the comment. Hi Louise, it's always a tough decision between ham and lamb, isn't it? Adding some rosemary to this dish would be wonderful if you decide to serve the lamb! Thanks for the comment. Hi Simone, isn't celeriac wonderful? Such lovely flavor! Have a great time in Switzerland, and thanks for the comment. Hi Mary Frances, it is, it is! Thanks for the comment. Hi Amira, doesn't this look great? And tastes so much better! Thanks for the comment. Hi Dawn, yeah, those after meal naps are pretty predictable, aren't they? ;-) Thanks for the comment. This looks ideal for the Easter ham. But then again, it looks so good that I could just eat this alone and be quite happy. I love this combination. Now that it's getting cooler, I'm all about casseroles and this one really speaks to me! Hi Carolyn, I actually tend to ignore the main dish so I can eat more of this! ;-) Thanks for the comment. Hi Denise, it's really good -- one of the best gratins I know. Thanks for the comment. Hi Maureen, this is great for your fall weather! And our weather has been kind of brisk, so it's great for us too. ;-) Thanks for the comment. Hi Kumar, this dish really has such a lovely flavor. And that brown cheese topping is terrific! Thanks for the comment. Hi Rocquie, cheese is good. ;-) And this dish does have quite a bit of it. Definitely adds a lot of flavor. Thanks for the comment. I like Mrs K.R's description of celeriac - it really is a wonderful vegetable, but it sure isn't pretty! I love how you've used it in these scalloped potatoes, John, and the Dijon mustard really is a great addition. Happy Easter! A fantastic combination and mouthwatering gratin! Scrumptious. I'm used to making this kind of baked, cheesy potato dish but I had never thought of the addition of celeriac. It sure could be called adding attitude. This looks pretty awesome! I love gratin potatoes, but the addition of celeriac would add a nice depth of flavor and touch of sweetness. Hi April, alas, celeriac is downright ugly, isn't it? So good though! The Dijon mustard really is a nice addition to this. Subtle flavor, but you know something is going on. Happy Easter to you, and thanks for commenting. Hi Rosa, isn't this nice? Totally delish. ;-) Thanks for the comment. HI Suzanne, celeriac plays so well with potatoes! I think they are soul mates. ;-) Thanks for the comment. Hi Amy, the combo of potatoes and celeriac truly is awesome! Just unbelievably good. ;-) Thanks for the comment. This looks soooo good! I have a weakness for baked, creamy potato dishes and with the addition of a flavour boost, even better!! I am beginning to realise, ever since I've had the blog actually, that there are so many vegetables and fruit people simply don't try. I take it as a challenge to at least try something once. I will research an ingredient and find a recipe and then buy it. I guess time is a factor in many lives. People just don't have the time to try new things, I'm guilty of that myself, but managing a blog kind of makes it obligatory to go and try something new! such a comforting dish! very homey! Hi Nazneen, one of the neatest things about blogging is it encourages one to try new things. Or to use things you know about in different ways. It's been years since I've used celeriac, and now I'm wondering why! It's sooo good. Thanks for the comment. Hi Sarah & Arkadi, isn't this nice? And you're right -- so comforting! Thanks for the comment. Celery root is still on my list as a food to try. I can't believe I've never tried it but then it's not something you see at the store every time you go. After seeing this gratin I'm definitely going to keep a look out for it. Your gratin looks like a big dish of comfort! Love the use of the Gruyère, one of my favorite cheeses! Great dish John! And the colour is golden delicious! I bet the celery root and potato do go well together in this dish! Great side dish idea for Easter right here!! Yum, John! Definitely going to try this! Hi Eva, celeriac works so well with potatoes! I think you'll enjoy this gratin. ;-) Thanks for the comment. Hi MJ, a big cheesy gratin is nice, isn't it? I really think you'll like celery root -- IMO it has such an interesting flavor. And it's wonderful when paired with potatoes. Thanks for the comment. Hi Laura, I'm actually with you on preferring this dish when it doesn't compete with something big -- so I can eat my fill of it! Thanks for the comment. Hi Terra, celery root is something worth trying. It's wonderful as part of a gratin like this! Thanks for the comment. Hi Uru, isn't a nice golden gratin so enticing? And the celeriac really adds some oomph. ;-) Thanks for the comment. Hi Ashley, the two really make a super combination. Perfect for Easter! Thanks for the comment. Hi LIzzy, this is a wonderful dish -- I think you'll be quite happy with it! Thanks for the comment. I have never used celery root and it sure looks awesome, a nice twist to the classic scalloped potatoes...something new that I should try. Hey, I think Mrs. KR has a great future in PR! And this gratin has a great future on my kitchen table. I've never met a gratin I didn't love! Mmmm...I never would have thought to add celery root to a potato gratin, but I love the idea!!! Happy Easter! Hi Juliana, celeriac really has a nice flavor, and it's particularly nice in this dish. Worth trying sometime, IMO. Thanks for the comment. Hi Shashi, that's actually a pretty good description of celeriac! ;-) The flavors in this really are great -- so good, I'm making it again this weekend! Thanks for the comment. Hi Beth, I've never met a gratin I didn't love either! And this one is especially deserving of love! Thanks for the comment. Hi Liz, isn't adding celery root to this such a fun idea? Delish, too! Happy Easter, and thanks for the comment. This is definitely a dish with ‘tude and perfect for an Easter crowd. I've yet to try celery root, so I haven't checked out the price. Now I'm curious, so you can be sure I'll be hunting it down at the store. Have a terrific weekend! Hi Charlie, interesting to hear that celeriac is pricey in Australia, too! Although I love rare lamb, I'm more and more coming to the conclusion that lamb is best cooked long and slow. Nice to have the choice between the two, though, isn't it? Thanks for the comment. Hi Kristi, don't you love a dish with 'tude? ;-) You have a treat in store for you when you try celery root -- I love its flavor! Thanks for the comment. Hi Carol, this recipe will definitely bow them away -- it' so wonderful! Happy Chocolate Bunnies to you, and thanks for the comment. I love gratins and this one with the delicious combination of Parmesan and Gruyere looks and sounds irresistible ! Happy Easter to you and your family, John! Hi Daniela, aren't gratins grand? And this one is outstanding! Happy Easter to you, and thanks for the comment. Never had celery root in a gratin, love the idea. I'm just now sitting down to do my menu, nothing like last minute scrambling, huh. Glad to see something different to add to the table. Hope you and the family have a very happy Easter. 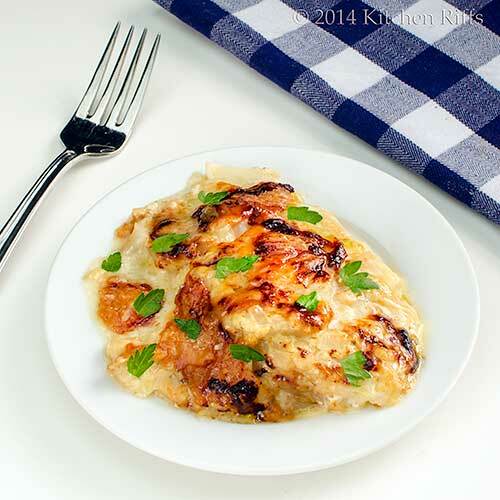 Hi Gina, celery root is a really fun addition to a gratin! Lovely flavor. ;-) Thanks for the comment, and Happy Easter! Celery root is something I must try....this looks delicious, John. I love to see updates on the old-time recipes. Nice photos, too! Hi Pat, celery root really has an interesting flavor -- very mellow. Goes great in this dish! Thanks for the comment. Hi Ala, this is a wonderful recipe! And the 'tude is so real. ;-) Thanks for the comment. this sounds incredibly delicious. I've never had this with celeriac root but I have a good imagination, so good I can smell it right now. I am bookmarking this and will make it the first chance we get some cool weather. I had celery root and mashed potatoes together for the first time in Germany this past fall. DEElicious. And yes, love the "tude. :) For the first time ever, I bought a standing rib roast instead of ham. Looking forward to a new adventure tomorrow. I've never made one. Hi Mireya, isn't this nice? So, so delish. ;-) Hope you enjoy! Thanks for the comment. Hi Lea Ann, don't celeriac and potatoes work so well together? Lovely combo! I haven't made a standing rib roast in years -- I should again, they're so good. You're going to have a feast! Thanks for the comment. What a perfect Easter dish! Love the addition of the celery root - delicious! Hi Kristy, isn't this great? Celery root ramps up the flavor of so many dishes! Thanks for the comment. Decided to go out for Easter Dinner, John. That solves that, lol...I'll be saving this gratin combination for "some day" soon. It must be scrumptious! Happy Easter John! This is such a great easter dish that everybody will absolutely love! Hi Louise, always a lot to be said for going out for a big dinner! Enjoy. I'll be going to my sister's house -- and will be bringing this dish. Plus Mrs KR is going to bake those great dinner rolls we posted a few weeks back. I hope you and Marion have a wonderful Easter! Hi Peachy, isn't this nice? Such great flavor! Happy Easter, and thanks for the comment. What a wonderful dish John. Funnily enough, I always have difficulties finding celeriac when I decide to use it... but then when I don't need it, there's a ton at the market (as of yesterday!). I might just get some and make this gorgeous gratin. It's heading into winter so it's the perfect time of year. Hope that you and Mrs KR have a lovely Easter! Hi Laura, I can always find celeriac, but often it's not good quality. But there's wonderful celeriac in the market at the moment! Thanks for the comment, and Happy Easter! 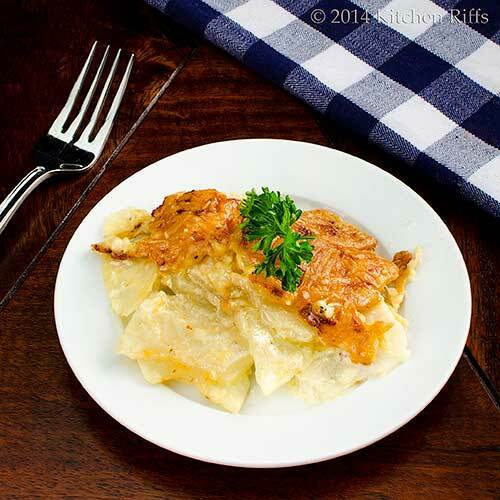 Scalloped potatoes are a family favorite at holiday gatherings. I think this would go over really well - it sounds fantastic! 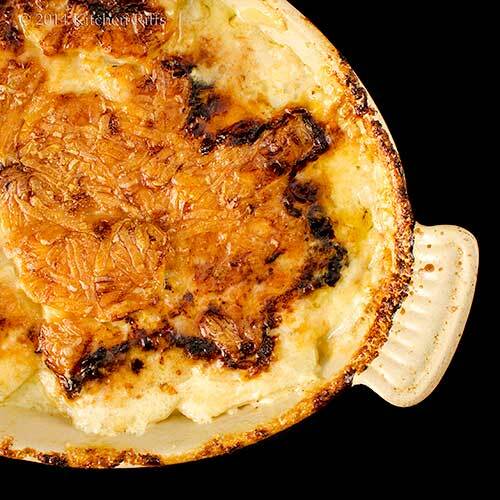 Love celeriac, hate peeling it, definitely going to try your knife method and make this gratin. Thanks for the helpful tip! Hi Sarah, I love both celery and celeriac! And celeriac is wonderful in this dish -- so, so good. Thanks for the comment, and Happy Easter! Hi Alyssa, scalloped potatoes are a universal favorite, I think. And IMO this is the best of the lot! Thanks for the comment. Hi Pamela, peeling celeriac really is a pain, isn't it? It still is using my method, but much less so. Thanks for the comment. I have never thought to add celeriac to a potato gratin, what a great idea. You have to love that comfy, cosy flavour of a potato bake! Hi Julie, celeriac and potatoes really do work so well together! And you're right this is comfy food! Thanks for the comment. Hi Greg, I've used mustard powder, never the whole seeds. I need to try that! I think the brown mustard seeds in particular would be nice. Great idea! Thanks for the comment. Hey, I think it would be a good idea if Mrs KR became a PR person- sounds like she's got the talent! The celeriac sounds like a good addition; maybe you could even combine some sweet potato with the recipe? Hi Fran, I've made a sweet potato gratin before, but never with celeriac. I'm so going to try that! Great idea. :-) Thanks for the comment. I learn quite a few new things from you guys every time I visit your blog. Thank you for a wonderful dish. I will try the celery root for the first time in my life.. Thanks to you. I can see why this would be a hit. I sound wonderful, love all the ingredients! Hi Ansh, I think celery root has terrific flavor! Hope you enjoy it. ;-) Thanks for the comment. Hi Chris, isn't this nice? Truly good stuff! Thanks for the comment. I hardly ever cook with celery root. This would be a great recipe to try! Thank you for sharing, my friend! Hi Monet, celery root has such a lovely flavor! And it's so great in this recipe. Thanks for the comment. Hi Rosita, isn't this a great gratin? I love its flavor! Thanks for the comment. Hi John, this look really good, great combination. Yours look so well done. 2 thumbs up for you. Hi Nami, I always include potatoes too -- they work so well with the celeriac. This is a good one. ;-) Thanks for the comment. Hi Taruna, this gratin is definitely worth a try, IMO. Celeriac adds so much. We had it again on Sunday! Thanks for the comment. Hi Amelia, this really is a great dish. Thanks for the 2 thumbs up! ;-) And thanks for the comment. Mrs KR is right about better PR for celery root - though you think all of those celebrity chefs cooking with it recently would do the trick. Even with that though, I think people find the similarity to a large lump of dirt a bit daunting. I love having a teen-aged check out person ask - what IS this thing? I think this would be a wonderful flavor combo - can't wait to give it a try! I love potato gratin but funny I have never cooked celeriac before even as roasted vege in winter. The mix of gruyere and parmesan in this recipe is awesome! Hi Jayanthy, it is, it is! Thanks for the comment. Hi Donalyn, you're so right that a lot of grocery checkers have no idea what celery root is. Too bad it's not better known -- such a great veggie. Thanks for the comment. Hi Chopin, celeriac is so worth playing with in the kitchen. Great flavor! Thanks for the comment. We just started a diet and now I see this and my mouth is watering. Forget cookies and cake, I want this. Pinning for the future which I hope isn't far away! Hope you had a great Easter, John and Mrs. KR! John, This is comfort food at its finest! Who needs meat with such a delicious side dish? This looks and sounds so good. A great way to hide other veggies that even a picky teenager would eat... Great idea! Hi Abbe, I get in trouble all the time with diets when I see food I need to eat, and soon! And I certainly like cookies and cake, but this is way better. ;-) Thanks for the comment. Hi Bam, although I often serve this with meat, I really like it best as the main course! So, so good. ;-) Thanks for the comment. I love using celeriac root, we have lots of dishes with it in Turkey. But the price in the US made me stop many times. And peeling is hard for me for some reason. Takes a lot of elbow grease for me. But you are right, potato and the root marry beautifully. If I was home, I would be making this! oooh, this sounds wonderful! I absolutely LOVE celeriac (and love saying "celeriac" as opposed to celery root, because it sounds fancy) and this sounds fantastic. i wish i would have thought of adding this to our own easter feast. Great recipe. Hi Ilke, I wish celeriac was more popular in the US -- I'll bet the price would go down in that case. Such a great veggie, though, isn't it? Thanks for the comment. Hi Shannon, there's always next year for Easter! Isn't celeriac great stuff? I love it! Thanks for the comment. I've fallen behind in my blog reading since I have been working in the orchard. I hope you and your family had a wonderful Easter. I know that you certainly ate well with dishes like this. Hi Karen, hope your pruning is going well! We did have a great Easter, thanks, and hope you had the same. And yes, we had this for Easter! Thanks for the comment. Wow! This gratin looks amazing, John. I've been on a celeriac kick lately but haven't tried it in a gratin. You've used some of my favorite things in the recipe...Parmesan, Gruyere, and shallots. I've seriously got to try this recipe. Thanks for sharing! Hi Bill, isn't celeriac wonderful stuff? I've been on a kick with it, too! And this recipe is outstanding. IMO, of course. ;-) Thanks for the comment. I don't know how I missed this, John, I was just at Eva's place and she referenced your recipe. What a great dish! Using celeriac is such a great idea, as are the Gruyère and cream. Yum! As much as I love potato gratin, I rarely make it unless there are enough guests at the table to ensure there are no leftovers, lest I finish them myself once everyone has left for home. Still, I wouldn't want to experiment with my guests. I'll just have to make this dish 3 or 4 times before any guests are involved. Yes, I value my guests -- but I treasure a good dish of potato gratin. :) Thanks, John, for sharing such a wonderful recipe. Hi John, you'll definitely want to "test" this 3 or 4 times before you serve it to your guests! Can't be too careful. ;-) Thanks for the comment. Hi Alessandra, isn't this great? I totally love it! Thanks for the comment. Hi Nusrat, isn't this a great dish? So flavorful! Thanks for those very kind words, and for taking time to comment.